Technological tools such as interfaces, sensors and probeware are increasingly prevalent in science classrooms. With increased prevalence comes a need to improve the research base on how to use technology in ways that maximize student learning. These resources potentially support inquiry-based learning approaches through the collection and transformation of data. Furthermore, by making data trends evident, these technologies have the potential to support construction of scientific explanations and complex reasoning. The purpose of this study was to analyze the levels of reasoning displayed by African American girls engaged in technology-enhanced inquiry so as to better understand the extent to which technology can support scientific literacy. Our results indicated modest gains in the girls' ability to display data and connect data trends to scientific phenomenon. We believe that studying the experiences and learning of students from historically underrepresented backgrounds in STEM is critical for ensuring equitable educational experiences and access to STEM-related professions. Black girls have historically performed lower on a number of academic measures when compared to girls as a whole, according to a report released by the National Women’s Law Center and the NAACP Legal Defense and Education Fund (Smith-Evans & George, 2014). Black girls continue to encounter deeply embedded racial and gender stereotypes and harsher disciplinary actions for non-conforming behaviors such as expressing their opinions. These girls, disproportionately concentrated in under resourced schools and less likely to be taught by highly qualified teachers, often have limited access to rich, meaningful science, technology, engineering and mathematics (STEM) instruction (Brickhouse, Lowry, & Schulz, 2000; Carlone, 2004). They are often overlooked for, or discouraged from taking advantage of, STEM learning opportunities by educators holding stereotypical beliefs about the girls’ abilities or interests. With less access to high quality science learning opportunities that lead to postsecondary STEM education and higher wage professions, Black girls face long-term socioeconomic effects (Smith-Evans & George, 2014). Maintaining the status quo in under resourced schools located in low socioeconomic (SES) neighborhoods reinforces the achievement gap for Black girls, especially in the face of major learning standards reforms such as the Common Core State Standards for Mathematics (National Governors Association Center for Best Practices, 2010) and the Next Generation Science Standards (NGSS Lead States, 2013) for science and engineering. 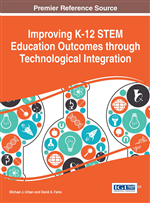 In particular, science education reform efforts (National Research Council, 2012; NGSS Lead States, 2013) emphasize scientific practices such as analyzing and interpreting data; using mathematics, information and computer technologies and computational thinking; and constructing explanations of scientific phenomena. To be successful in STEM, students increasingly need to perform at higher levels of complex reasoning, such as analyzing empirical evidence and generating arguments and explanations (NRC, 2012). Yet, the situation in schools with high percentages of Black girls continue to engender pedagogical approaches that do not promote student ownership for learning or the development of complex reasoning skills (Songer, Lee & Kam, 2002). In addition, the Black girls in these low SES schools continue to be less likely to use technology for creativity, problem-solving, or higher-order thinking required in science inquiry (Songer et al., 2002). To what extent did the girls use technology proficiently to collect and represent data during inquiry? What categories of complex reasoning were displayed in the girls’ interpretations of data collected during technology-enhanced inquiry? Did the categories of complex reasoning change over subsequent encounters with technology? If so, how?